Another way to think about what makes a country competitive is to consider how it actually promotes our well-being. A competitive economy, we believe, is a productive one. And productivity leads to growth, which leads to income levels and hopefully, at the risk of sounding simplistic, improved well-being. Productivity is important because it has been found to be the main factor driving growth and income levels. And income levels are very closely linked to human welfare. So understanding the factors that allow for this chain of events to occur is very important. Basically, rising competitiveness means rising prosperity. At the World Economic Forum, we believe that competitive economies are those that are most likely to be able to grow more sustainably and inclusively, meaning more likelihood that everyone in society will benefit from the fruits of economic growth. We break down countries’ competitiveness into 12 distinct areas, or pillars, which we group into three sub-indexes. These are “basic requirements” which comprise institutions, infrastructure, macroeconomic environment and health and primary education. We call these “basic” as these pillars tend to be those that countries at earlier stages of development tackle first. Next comes our “efficiency enhancers” sub-index. Essentially we’re looking at markets – whether it is the functioning of goods, labour or financial markets – but we also consider higher education and training, and technological readiness, which measures how well economies are prepared for the transition into more advanced, knowledge-based economies. Our last pillar, innovation and sophistication, consists of two pillars: business sophistication and innovation. 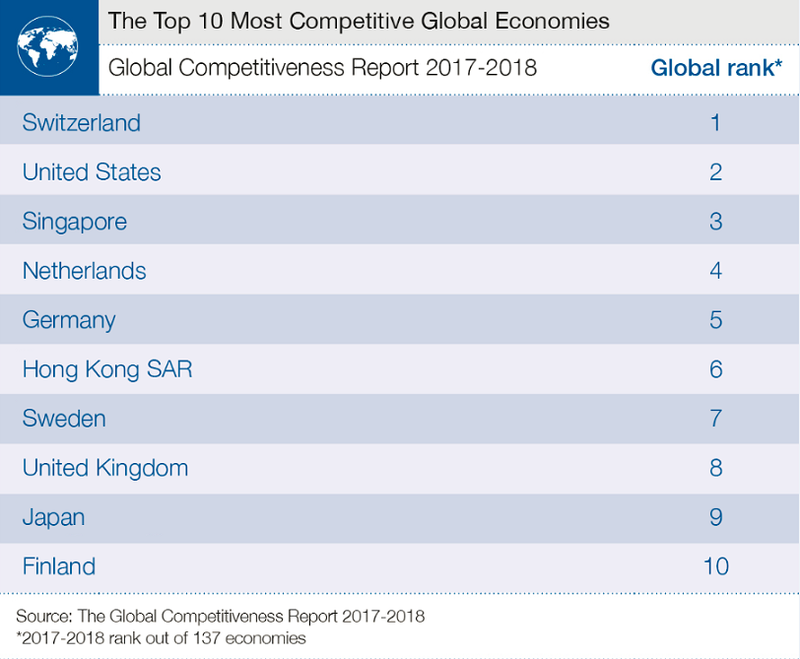 These are more complex areas of competitiveness that require an economy to be able to draw on world-class businesses and research establishments, as well as an innovative, supportive government. Countries that score highly in these pillars tend to be advanced economies with high gross domestic product per capita. Our global financial system could be at risk to another external shock. 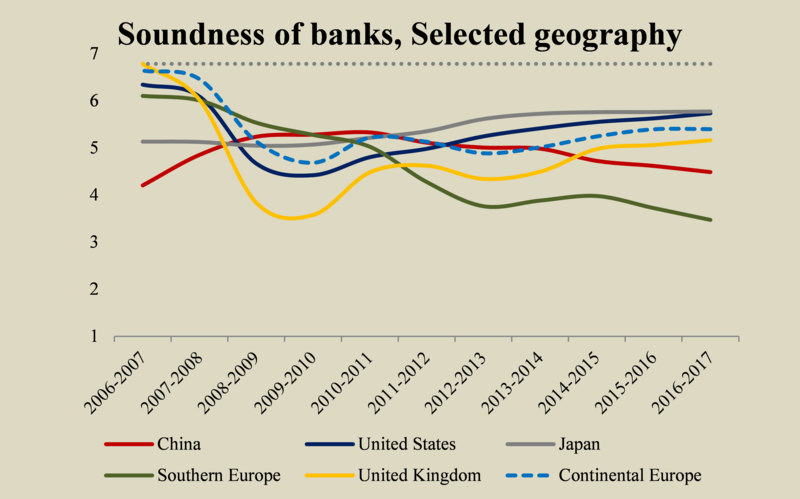 Our data suggest banks are less sound than they were before the crisis. In some regions of the world they are declining further. Why does this matter? Well for one thing, governments have very little bandwidth to cope with another banking crisis so soon after dealing with the last one. And with high levels of personal debt in many advanced and emerging economies, we are already aware of one potential catalyst for a future shock. Flexible labour markets and workers’ rights are not mutually exclusive. So much conventional wisdom is given over to the idea that unemployment can be solved by making it easier to hire and fire people and put them on insecure, short-term contracts. However, while such "labour market flexibility", as economists call it, is certainly important in kick-starting a jobs market, it can also act as a barrier to workers being able to land sustainable, secure work. According to our Index, economies that have been able to combine labour market flexibility with robust protection of workers’ rights have been more successful at achieving higher levels of competitiveness, higher employment and lower inequality. The figure above plots countries’ labour market flexibility against their protection of workers’ rights, based on the International Trade Union Confederation (ITUC) Global Workers’ Rights Index. It overlays these indicators with data on inequality, as measured by the Gini coefficient, and the share of the population who are employed. From it, we can see that two-thirds of countries with high levels of inequality have below-median protection of workers’ rights, while two-thirds with lower levels of inequality protect rights more strongly. Is technological readiness the cause of the productivity paradox? Trying to figure out the reason why ever increasing investments in technology is not leading to comparable increases in productivity is one of the most active areas of economic debate today. According to our data, improvements in innovation are often failing to have wider impact due to the fact that many countries – especially emerging markets that are accelerated their innovation capacity rapidly – are achieving much slower progress in the area of ‘technological readiness’, or preparing firms and people to take advantage of new technologies as they come online. In the graph above, we can see that technological readiness is generally trending upwards globally – but it is not rising as fast as innovation, meaning that the benefits of innovation when they occur are rarely spread inclusively across the workforce. 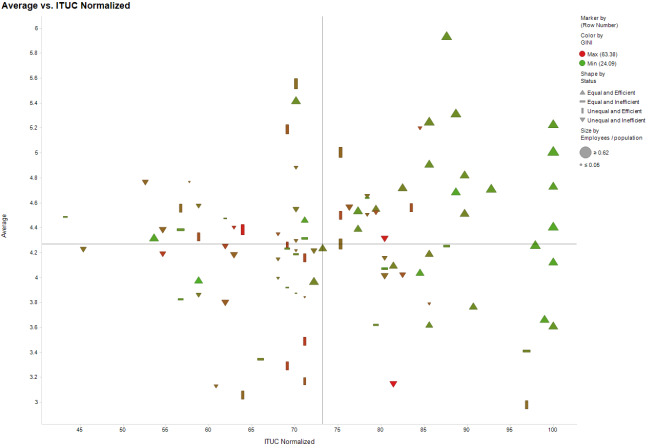 What doesn’t competitiveness tell us? Our work in the field of competitiveness is aimed at helping leaders and policy makers make the right choices when it comes to lifting people’s economic wellbeing. But while our calculations take in over 100 separate measurements for each country, the relative importance of each one of these is constantly shifting. This is why we constantly review our methodology to make sure that it is as relevant as possible in our changing world. Competitiveness also doesn’t tell us as much about the future as we would like. For example, in the Fourth Industrial Revolution we know some things for sure, such as many jobs will become replaced by automation and robots. This could well make our education increasingly important, as economies shift to higher value, higher-skilled work. Again, it’s another reason why we need to keep a critical eye on what and how we measure economies. There are so many other factors so important to life and well-being that are not included in our competitiveness work. The inclusiveness of economies for one thing (although this is also very important to us). And we still haven’t found a good way to include environmental stewardship into our calculations. Given the interconnectedness between nature and man-made systems, it is more than likely that environmental sustainability will play an increasing role in determining economic success in the future.